The week went by like any other, but at the same time there was a heaviness to it, a heaviness that could be attributed to any number of things, or nothing at all. Elliott, in his own way, also felt the heaviness. There was physical heaviness. I took delivery of 500 lbs. of beeswax. It shipped from Sleeping Bear Farms and late Wednesday afternoon I met the truck at Jerry’s Auto Repair in downtown Pelkie. Jerry and the driver of the truck helped me to load the wax, which was packaged in three large boxes, into the van. Back home I hauled the various-sized blocks and chips of wax out of the boxes and stacked them in the garage. While waiting at Jerry’s I’d been waving my hands around my head like a crazy woman, battling the gnats, or sand flies, as Jerry called them, and back at home I was plagued by wasps. They zipped in and out of the garage on missions of late August, crashing into me, ricocheting off my head. The garage is heavy with wasps. All week the atmosphere has been heavy. Heavy with heat and humidity. Storms. Nights with lightening flashing non-stop in the northern sky. Rain drumming down. Thunder booming. 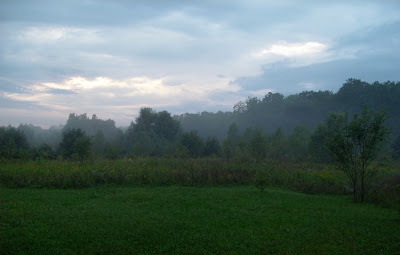 And mornings so thick with fog it was like a George Romero movie fading at noon not to zombies but to a blazing hot sun. But the heaviness was more than that. At night, before the rains, an insect chorus louder than I’ve ever heard. Crickets and grasshoppers with a constant hum, a ringing in the ears, an incessant whisper overlaid with broad suggestion, loud chirping, throaty trills. Over to the west, in the taller grass, a little maraca action—perhaps even a whole little mariachi band?—and off to the east a tambourine being shaken to beat the damn band. How can one sleep with all this racket? Not me. So I’d get up and write. And write and write and write. Sometimes writing takes me through and past whatever it is, but other times it just seems to tunnel nowhere. I took it easy on the candles, hardly mowed at all, stacked just a little bit of wood, and spent one whole afternoon floating downriver in an inner tube. 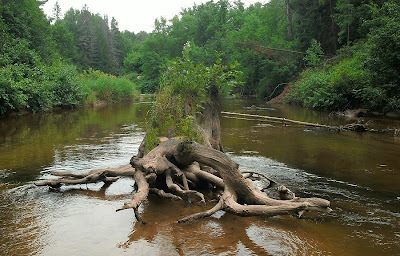 A stump in the middle of the river far from home. Other afternoons I just went up to the bend in the river and spent time in the cool waters that swirl around the many years of fallen trees and tangled branches that get caught up in the bend. I sat on the sandy beach of the shifty old island and watched minnows in a shallow pool. A tiny bit of the river flowed into and out of this pool, spilling back out over a submerged log, creating a deeper pool at the bottom of which lay red and white and grey and brown stones. In the bottom of the shallow pool, pebbles covered with the darting black shadows of minnows, shadows as thin and fleeting as trickles of sweat. The little fish swam close to the log but never plopped over it while pieces of leaves and twigs did. A brown frog no bigger than my thumb squirted about. Looked like the same type of frog I’d seen up around the house. I read a letter from a friend while at the post office, waiting to renew my box for another year, and enjoyed the letter so much I wrote back that very night. 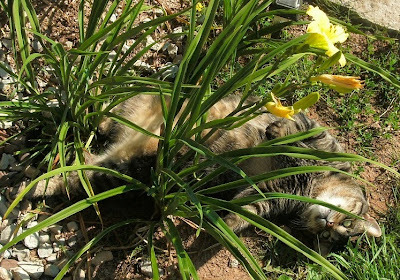 There was a five-legged grasshopper in the garden. I noticed it one morning on the sunflower, which is hanging its head. I noticed it the next morning, too, scuttling around the broccoli. 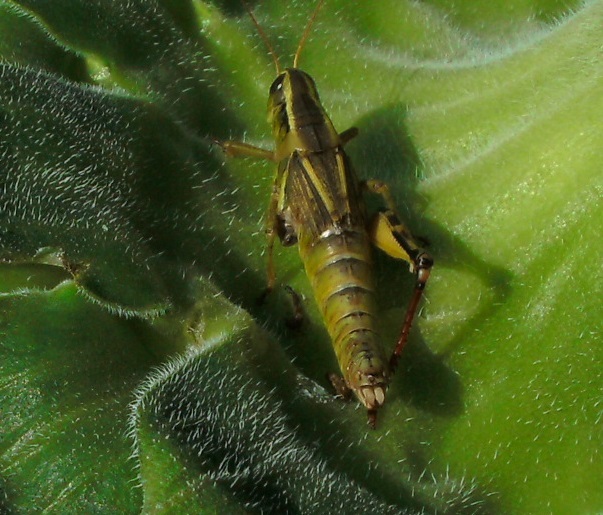 Between the nighttime cricket racket and the five-legged grasshopper, not mention all the fully legged grasshoppers flying up into the air with every step on the way to the river, I looked up Grasshopper/Cricket in my Animal Energies book. The gift of these insect relatives is the power of song and sound. 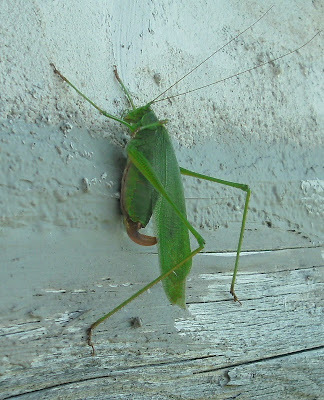 Nothing too heavy there, except for this idea that we are related to grasshoppers and crickets and I suppose katydids too. Ole Grandpappy Katydid hanging out by the back door. But so what? What if we are? Imagine the poor cricket trying to fathom being related to us. Okay. What’s this heaviness about? It’s inside and it’s outside and it’s everything and it’s nothing. It is just there. Sometimes it is just there, isn’t it? I don’t know what it is. But it is as if I know, and something has to give. Something has to change. Something has to break free. Right now it is absolutely calm. Fog sits. Thunder rumbles. Friday evening Sadie suddenly appeared in the yard. Elliott and I were on the porch. The sun was dropping low and bright in the sky; my eyes were closed against it. When I opened them, Sadie was there, just on the other side of the chokecherry tree about fifteen feet away. She came around the tree and stood off the south end of the porch, staring at us. I could see flies on her face. On her left side was a wound. It looked fresh, greyish, big as a fist and covered with flies. She kept throwing her head back toward it, rousing the flies. After a minute or two, she took off, loping westward.